During a recent visit to Bangkok I had the most delectable prawn and pomelo salad at the Metropolitan Hotel. It has the classic Thai flavours sweet, sour, salty and hot....yet also the crispy caramel crunch of coconut....it's like heaven in a bowl! With the recent warm weather I was inspired to try and recreate that memory. It's hard to get pomelo's in the burbs (and I didn't have time to visit Pon Tip Thai grocery in the city) ....so I thought I'd improvise with ruby red grapefruit and valencia oranges which would give a great colour conturast. Traditionally this dish uses freshly grated coconut, yet without a coconut grater it's too hard a feat, so this home cook found shredded coconut works extremely well. A little tip.....make sure you use ripe grapefruit as its a little sweetar and beautiful fresh prawns and cuttlefish. This salad won't last....so if you want to make it ahead of time make the eschallots mixture, the cuttlefish, peel the prawns and make up the dressing but store them all separately and then toss just before serving. Have a go.....you'll be pleasantly surprised. 1 Heat a large wok over medium heat. Add shredded coconut, cook, stirring for 2 minutes or until toasted and golden. Transfer to a bowl. Set aside to cool. 2 Heat half the oil in the wok over medium heat. Add shallots and cook for 3 minutes or until shallots have softened. Add garlic and chilli and cook for 1 minutes. Stir in coconut milk. Remove and set aside. 3 Cut cuttlefish to open out like a book. Score the inside of the flesh in a diamond pattern. Cut in half. Heat remaining oil in the wok. Add half the cuttlefish and cook for 1-2 minutes or until just cooked through. Transfer to a bowl. Repeat with remaining cuttlefish. 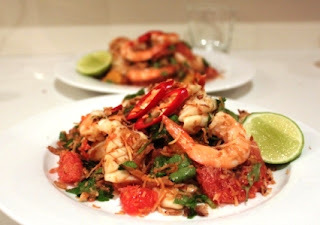 4 Combine cuttlefish, grapefruit, orange, shallot mixture, prawns, toasted coconut, coriander and mint leaves in a bowl. 5 Combine lime juice, sambal manis, chillies, fish sauce and palm sugar in a small bowl. Pour over prawn mixture, toss to combine. Serve immediately with lime cheeks.